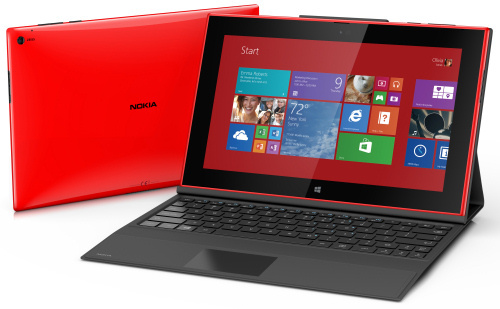 The Nokia Lumia 2520 is Nokia's first Windows-based tablet, although to be pedantic it isn't the biggest Nokia ever, nor is it their first tablet. It's an important device as far as Nokia is concerned, because it is their first modern tablet device.. and it's an important device for Microsoft too as the Windows RT platform that runs on the 2520 has not been a market success so far. There is only a limited amount of things you can do design-wise with what is basically a touchscreen in an enclosure, but the Nokia Lumia 2520 does have many similarities with the good-looking Lumia smartphones. On the front is a 10.1" full HD 1920 x 1080 pixel IPS display with Gorilla Glass 2 plus a two megapixel video-calling camera and a pair of stereo speakers. On the back is a 6.7 megapixel camera with Zeiss optics looking a little bit lost in the large expanse of shiny plastic. Inside is a quad-core 2.2GHz processor with 2GB of RAM and 32GB of internal memory plus a microSD slot. 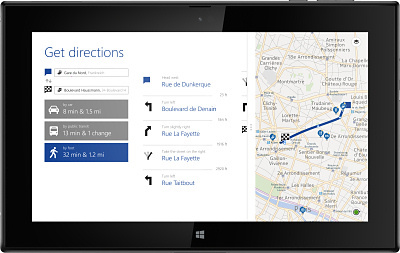 The Nokia Lumia 2520 supports GSM, 3.5G and LTE data plus WiFi and it also has NFC support, plus GPS and GLONASS and USB 3.0 connectivity and Bluetooth 4.0. There's a micro HDMI port too for outputting to an HD TV, as well as support for DLNA and Miracast. Windows RT hasn't really been popular with consumers so far, but in our opinion this works very well on tablet devices. The Lumia 2520 ships with the latest version 8.1 of Windows RT which has only just been released. It may not have the application library of an iPad, but it will do everything that most people will want it to do, and it does come with preinstalled versions of Office and Outlook. In terms of hardware then, the Lumia 2520 is broadly comparable to the outgoing iPad 4. The footprint is around the same although the Nokia is about 6% lighter. Despite the 2520's display being full HD, it only has about two-thirds of the pixel count of the iPad. However, at $499 in the US the Nokia is only two-thirds of the price of the equivalent Apple product. An optional "Power Keyboard" is available for an additional $149 which comes with a full keyboard, trackpad, 2 USB ports and an additional battery. Nokia says that the Lumia 2520 should start shipping first in the US during Q4, followed by the UK and Finland plus additional countries. Microsoft's existing Surface tablets have not been selling well, but the "Nokia" badge on this device may well stir some interest. Available colours are glossy red and white or matte black and cyan. 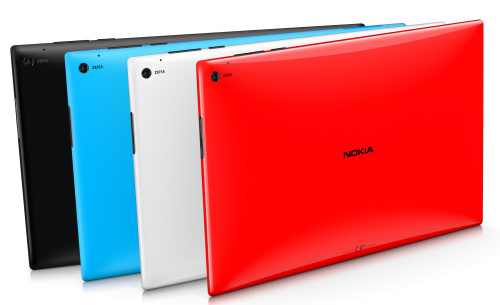 So is it Nokia's first tablet? No - that was the Nokia 770 which sported a 4.1" screen and ran the Maemo OS. The Nokia Booklet 3G was also a physically bigger product, and in the past Nokia have made computers and monitors too. But be warned, injudicious use of these facts may lead to accusations of pedantry!